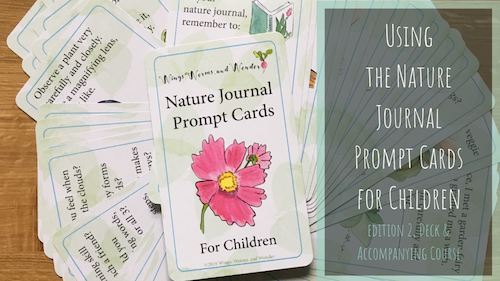 The new Nature Journal Prompt Cards for Children, Edition 2, are here!!!! These cards are seriously so cool I can hardly even believe it. The whole package (deck, box, pamphlet, print and paper quality, color saturation – everything) exceeded my own expectations, and I set high bars for myself! + It all comes tidy in a super functional and classy box to keep it all organized!! + The deck both aligns and perfectly compliments my books Wings, Worms, and Wonder and Wonder and Wander! And, being Printed on demand, they ship anywhere in the world!! So Awesome! *It’s now professionally printed on high quality slick and thick card stock for great durability. 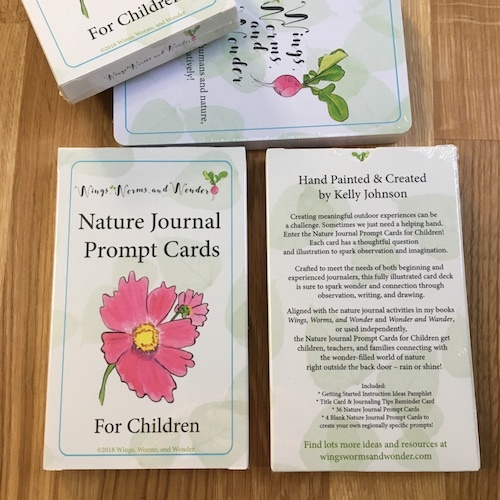 *It includes 4 blank on the front “Make Your Own” Prompt cards so you can create some regionally specific prompts with which to connect to your nearby nature. 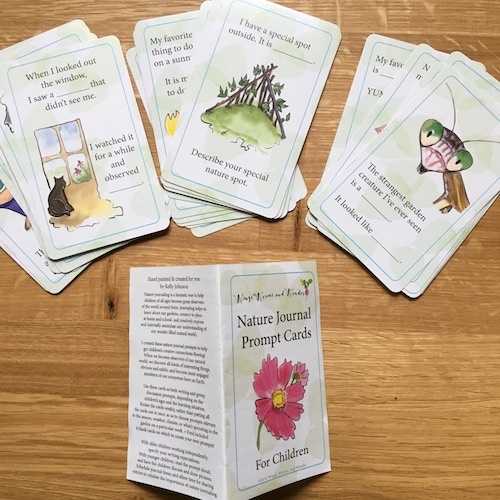 *The deck and pamphlet comes in a custom printed box to make it easy to take your cards on the go and to keep them together and organized. 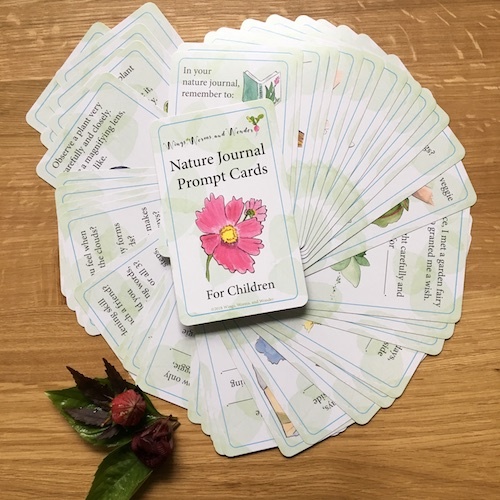 *The Using Nature Journal Prompts eCourse, Edition 2, is updated and FREE & included with purchase of the Edition 2 deck as an additional resource! I am so excited to offer these new, improved, updated 2nd Edition out to the world! And make sure you’re subscribed to my email list, (check the side bar to your right) because a Spanish version of the deck is coming out in 2019! 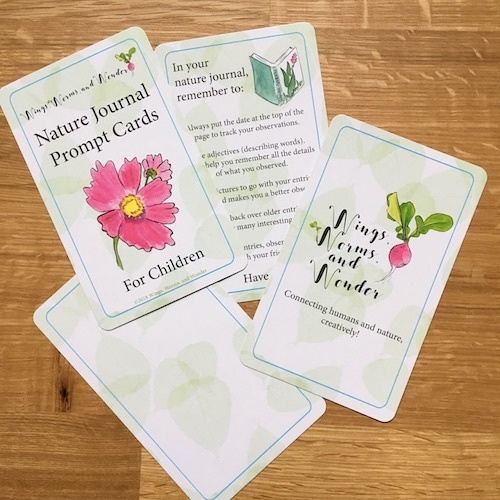 Click to get your own Nature Journal Prompt Cards for Children Deck Here!!! 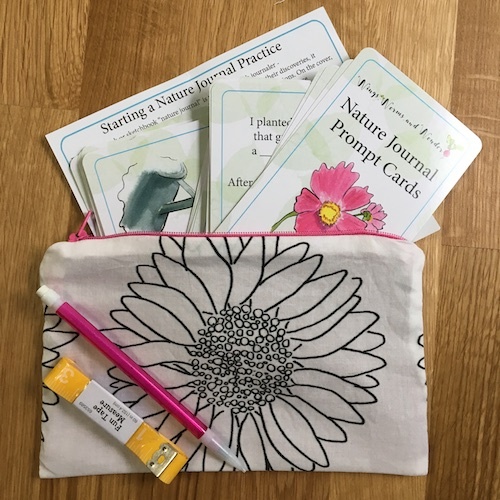 I also made Nature Journal Deck Pouches! 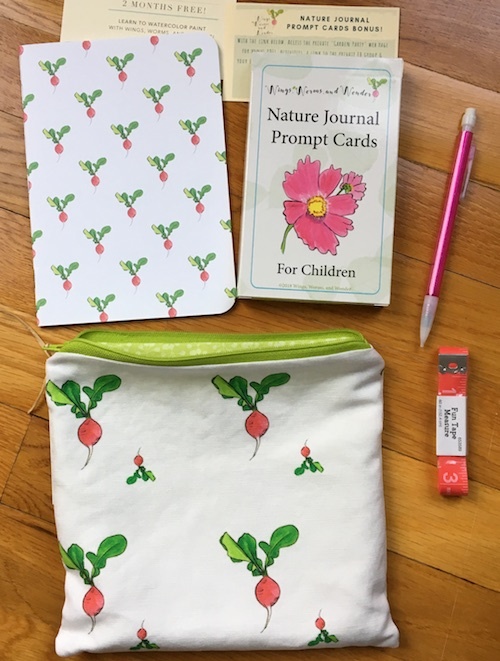 Complete with the new Deck, a handmade zipper pouch sewn from my custom designed fabric, and including a custom radish journal, mechanical pencil, and tape measure for all your nature drawing and exploring fun! These are currently available in a few designs and make great gifts for elementary age children as well as teachers! Click here to get them in my Etsy shop!